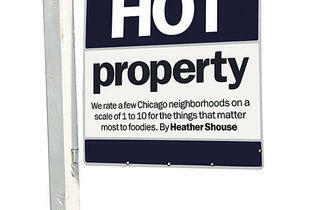 We rate a few Chicago neighborhoods on a scale of 1 to 10 for the things that matter most to foodies. Grocery options: 8. Jewel covers the basics; two carnicerias offer Mexican staples; while Olivia’s, Goddess & Grocer and W Crossings cater to busy foodies craving gourmet-to-go and home cooks looking for fancy ingredients. Cheap eats: 4. Budget options are few, but Sultan’s Market, Harold’s Chicken, Potbelly and the new Bon Bon Vietnamese Sandwiches do the trick. Swank spots: 8. Tablecloth dining is rare, but elevated eats can be found at upscale-casual restaurants like Takashi, the Bristol, Duchamp, Mado, bin wine café, Mirai, Mana, Bluebird and HotChocolate. Grocery options: 6. Treasure Island offers above-average staples; Hyde Park Produce has plenty of fresh stuff; and Zaleski & Horvath have brought a gourmet grocer to the ’hood. Cheap eats: 5. Medici is the choice for families, students and milk-shake fiends, while Valois and Pancake House are king and queen of budget breakfasts. But that’s about all the news fit for print. Swank spots: 3. La Petite Folie remains the go-to for special occasions, but Park 52 and Chant are newer and hipper (if less “dressy”) options. Aside from that, most folks celebrating something head north. Grocery options: 3. Neighboring ’hood Chatham has a couple of options and there’s a Shop & Save on 71st, but the selection is basic. Cheap eats: 8. While not exactly diverse, budget options abound, with soul food staples like Army & Lou’s, Soul Vegetarian and Izola’s, barbecue greats like Lem’s, Uncle John’s and Barbara Ann’s and Caribbean-tinged spots like Café Trinidad and Daddy O’s Jerk Pit. Swank spots: 2. A nice night out can be had at the Senegalese Yassa, but there are really no options for special-occasion dining. Grocery options: 7. Residents swear by the cheap and fresh produce at Edgewater Produce, while staples can be picked up at Jewel. Middle East Bakery and Pars Grocery cover everything from spices to coffee to hummus. Cheap eats: 6. Technically, budget spots like Alice & Friends, Ethiopian Diamond and Abyssinia along Broadway are in Edgewater, but they’re close enough to count for something. And while it's not exactly cheap, the sweets at Pasticceria Natalina are worth a fiver anytime. Swank spots: 8. Anteprima tops this list for delicious regional Italian; Great Lake makes one of the best pizzas in town; Big Jones serves up Big Easy flavors in a classy setting; and Hopleaf, while not exactly swanky, is a great gastropub-night-out. Grocery options: 7. Greektown’s Jewel is solid for most shoppers, but hard-core home cooks have access to wholesalers like Isaacson and Stein for seafood, Graziano Grocery for Italian imports, plus Peoria Packing and Columbus Meat Market for poultry, pig and more. Cheap eats: 5. Jerry’s Sandwiches, Bari Foods and Bombacigno’s J & C are great lunch options, but best bets for saving dough on dinner will likely lead you to average pub grub. Swank spots: 9. Avec, Blackbird, Sepia, Province, the Publican, Follia, Moto, Sushi Wabi…the list goes on. Grocery options: 10. With Trader Joe’s, Whole Foods, Treasure Island and Dominick’s, plus Stanley’s, Gepperth’s, Dirk’s and Trotter’s to Go, the only thing limiting shoppers is their bank accounts. Cheap eats: 7. Maza, Little Brother’s, Fattoush, Ja Grill, Hai Yen and Simply It help add ethnic-eats cred, while stateside classics can be snagged for chump change at Five Guys, Spicy Pickle, America’s Dog and countless ice-cream and cupcake shops. Swank spots: 10. 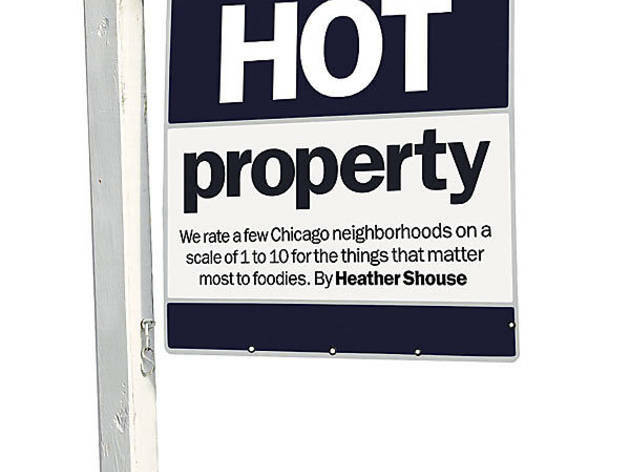 It’s a no-brainer that the second-wealthiest neighborhood in Chicago (after Gold Coast) would be teeming with fine-dining options, including heavy hitters Alinea, Trotter’s and L20. Factor in midscale spots like North Pond, BOKA, Perennial and Riccardo Trattoria and you have birthdays and anniversaries covered for the next few years. Grocery options: 7. Andy’s Fruit Ranch and Cermak Produce keep the salad bowl stocked; a handful of other supermercados and carnicerias feed Mexican cravings; and Middle Eastern ingredients can be found all along Kedzie. Cheap eats: 9. Chicago Kalbi, Kangnam, Hourglass and Sogongdong Tofu House serve stellar Korean; Salam, Semiramis and Al Khayameih are standout Middle Eastern; plus great Latin American can be had at Pupuseria y Restaurante Cuscatleco, Con Sabor Cubano and El Huarachin Huarachon. Swank spots: 2. Arun’s just keeps on ticking for those looking for fancy Thai.